I can't seem to find a way to do a couple things, all in the same vein. When viewing fork crown clearance, I am trying to see the measurement from the top of the tire to the bottom of the fork crown... I can view the tire diameter, and see that it is close but not touching, but I can't find a way to get a measurement. Is this possible? 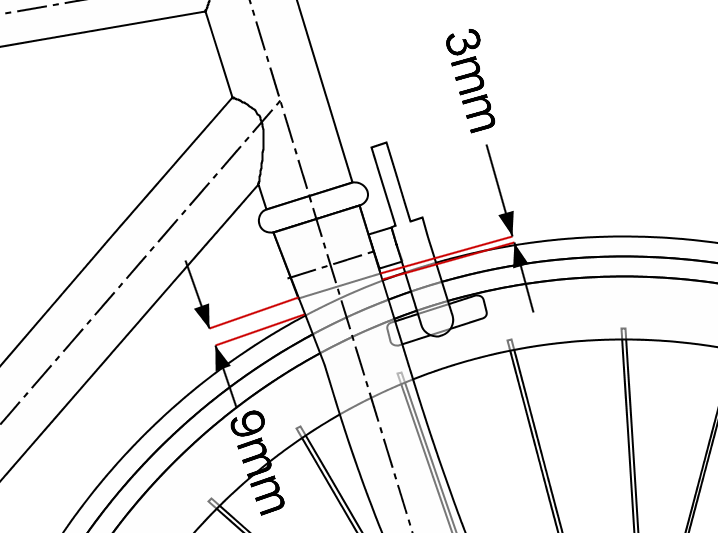 Also, when viewing fork crown clearance, is it possible to find the distance from brake hole to the rim/braking surface centerline? I can do the math by looking at the BSD, braking surface width, and the forks K measurement, but is there an easier way? This new version looks amazing, I'm glad I have been procrastinating plotting a run of 7 bikes that are next in line! Thanks Brent, I really admire all the work you put into this! It doesn't go unnoticed! The dimension you are describing could actually be a couple different values depending on whether you are measuring the clearance at the front edge of the crown or the rear edge of the crown. Both dimensions could be of interest. I've been meaning to include those dimensions but have yet to do that. In the meantime, you can always create those dimensions yourself as user dimensions. Here's an example of what I mean. If these dimensions work for you, I can plan to add them to the next update of BikeCAD Pro. While your second question was to do with the front view of the fork, the image above illustrates how displaying such a dimension in the front view could be misleading. Because the rake of the fork brings the axle of the front wheel forward, it is not actually the highest point of the rim that passes directly below the crown of the fork. Be aware that you can add several dimensions to the side view of the brakes. Would the X and Y dimensions that locate the brake pad relative to the brake hole or cantilever boss not serve to display the information you're describing above?